It may seem odd that we would say education starts with a glass of clean water. Yet, when you think about it, not everyone can assume they have access to clean water each and every day. There are many thousands of people in the villages of Julticalpa, Honduras who simply do not have that luxury. In fact, most do not. So, since drinking water is a necessity for survival you can imagine the health issues that are encountered when having no other choice than to drink contaminated water. 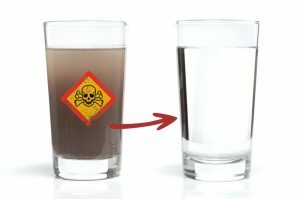 Ingesting dirty water means being sick for 2 or 3 days. As a result, one cannot make it to school no matter how well-intentioned. Spearheaded by the the Mission Honduras leadership at Holy Family Catholic Church, efforts to provide purified water began in 2014. After years of medical missions treating parasitic diseases, it became apparent that the health of the communities we serve starts with access to clean water. If children are to grow and thrive in school, their parents must have clean water for drinking and cooking. Thus the decision was made to extend our focus to include providing clean water and education to the communities that we serve. Working in partnership with a Honduras based non-profit organization called the Olancho Aid Foundation, HFCC Mission Honduras provides financial and manpower resources for these projects. In preparation for installing a purification system, the Foundation is diligent in its process to be sure each community is ready for the responsibility of managing a system. Olancho Aid trains community members to run the systems, creating 2-3 jobs in each location. The Foundation maintains systems with weekly inspections to ensure both functionality and accountability. The entire process from preparing a community, building the structure to house the system and finally installation can take 3-6 months. During that time, each community invests what they can in the project. That may include materials, labor, or education so their children learn the importance of clean water. 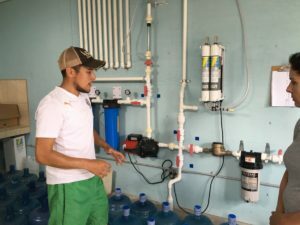 Olancho Aid ensures that every purification system is a sustainable partnership with the community. Members of the villages are trained to maintain and manage the system and oversee the distribution of the purified water. Families will travel to obtain their weekly or semi-weekly 5-gallon jug of water. They purchase the water for a significant discount over other pure water vendors. Not only do the systems provide a vital source of pure water but the installations create jobs within the villages. Do date, through the generous donations of our benefactors, 10 water systems have been installed do date with 6 coming in the year of 2016. With God’s help (and yours) we hope to see 17-20 villages getting fresh water. There have been over 10,000 lives directly affected by access to clean drinking water. It boils down to about $1.20 per person for a lifetime of access to this water. Costs of a system average about $10,000 for an electric run system; $13,000 for a solar system. Solar systems are NOT a luxury, it’s a necessity as many villages do NOT have electricity. Can you imagine that? What a gift of mercy to lighten the load of these beautiful families by providing them access to clean drinking water! We hope you can see yourself saving thousands of lives and improving the well being of children and families of all ages with a generous donation. Take a look at our video on the right to see how impactful your donation will be. We are always looking for help. You can help move more clean water into the villages by place a donation today.